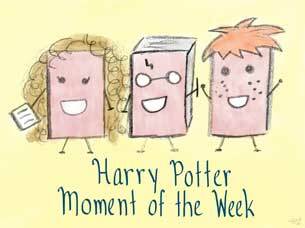 Mrs. Weasley nodded and turned the doorknob, but apparently Mr. Weasley was holding tight to it on the other side, because the door remained firmly shut. "Molly! I've got to ask you your question first!" "Arthur, really, this is just silly. . . ."
"What do you like me to call you when we're alone together?" Even by the dim light of the lantern Harry could tell that Mrs. Weasley had turned bright red; he himself felt suddenly warm around the ears and neck, and hastily gulped soup, clattering his spoon as loudly as he could against the bowl. "Mollywobbles," whispered a mortified Mrs. Weasley into the crack at the edge of the door. "Correct," said Mr. Weasley. "Now you can let me in." Awwwww ♥ That was SUCH a sweet moment! I love that you picked this, it's pretty much made my day :) I adore Arthur and Molly separately but as a couple they are just the best, hands down. They're so sweet and so clearly in love. I can't get enough of them! Oh I love them too! Arthur is like a muggle hoarder of sorts & Molly is stern but indulgent at the same time. I love their chemistry so much I want to be a Weasley too! Awwe <3 so cute!! I love that scene. What a great one to share for Valentine's Day. Those two really make a great pair.